Call it out, stating directly what is perceived. 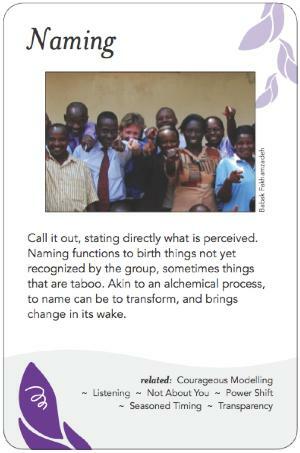 Naming functions to birth things not yet recognized by the group, sometimes things that are taboo. Akin to an alchemical process, to name can be to transform, and brings change in its wake. Like Translation and Reframing to which it is related, Naming is a basic core facilitation skill, whether practiced by the facilitator or by others. One speaks what has not yet been spoken, or better yet supports a group member to do so. This initial framing may have a profound impact on the group's relationship to that which is named. There is a great difference between saying, "The old guard is blocking the way to change," compared to "I see the elders of the group protecting that which has been carefully nurtured for many years," compared to "The new and old members each bring different energies; what is the valuable gift of each?" Sometimes Naming is saying what the group knows is true but isn't talking about; unnamed undercurrents can have a profound effect on the group. Naming taboo topics or other skewing influences can function as an important corrective and is sometimes downright cathartic. For example, if a group is suffering from unacknowledged power differences (as contrasted with clear and effective hierarchy and role differentiation), getting real about this can free up energy so that the group can proceed with its purpose. Obviously this needs to be done in a respectful and careful manner. If you are an outside facilitator, it's the group members who will have to live with consequences after you are long gone, so the goal here is to invoke the skill in such a way that it builds future capacity in the group. Naming can also create a safe space for truth-telling, and sometimes it isn't safe to tell the truth, in which case a wise facilitator will name that "truth". Naming can be an iterative process. Naming a contentious item may provoke both positive and negative reactions in a group. As the group works through those reactions, further clarity arises, and this can lead to a new naming, and new reactions. Self-awareness and courage are job requirements in this, as is ownership of the naming: it's cleaner to communicate as a personal observation, rather than a pronouncement. Sometimes it can be as simple as identifying an awkward feeling and asking the group if there's a relevant issue knocking on the door. Other times what needs Naming are the stakes, a reminder as to why we are all here and why what we're doing matters. Knowing what to name and when is part of the flow that arises from being fully present. Once something has been named, the group can then decide whether to further explore or to lay it aside. Be aware of jargon or unfamiliar terms in your naming. Don't mistake naming something for fully comprehending it. Tree Bressen once worked with a cohousing group where the tension was clear but no one was willing to name it or address it directly. She passed out blank cards to everyone and asked them to write down an answer to "What do we most need to talk about today?" without signing their names. The cards were passed in to a basket and then each person drew one out and read it aloud. This succeeded in bringing the tricky issue of the fierce tension between one family and the rest of the community out into the open, and in a way where the group was responsible for naming it rather than Tree as outside consultant. Daniel Lindenberger once worked with a grassroots organization whose rapid growth sparked tensions around how decisions were made. He named and outlined common phases of growth in similar organizations, and the challenges each phase met. This shifted the group from blaming individual members for causing the tensions and allowed them to contextualize their issues as being fairly standard "growing pains" due to their success, rather than as an indication of their failure to work well together. In this case Naming from an outside consultant helped the group reframe their challenge. Peter Block's book Flawless Consulting and Geoffrey Bellman's book The Consultant's Calling both address the importance of authenticity and being willing to say what is as part of the facilitator's craft.